Google just happens to be one of those tech companies that loves putting their brand just about everywhere. Naturally, many of us know of Google’s Chrome OS and how it gave birth to the Chromebook, along with it’s many iterations. Now, even Asus is promoting it’s new Chromebook Flip with Google’s OS on it. Asus is also coming out with a Chrombit. The Chromebook Flip will essentially be a laptop-tablet hybrid with a bit of a spin on it, along with a touchscreen. 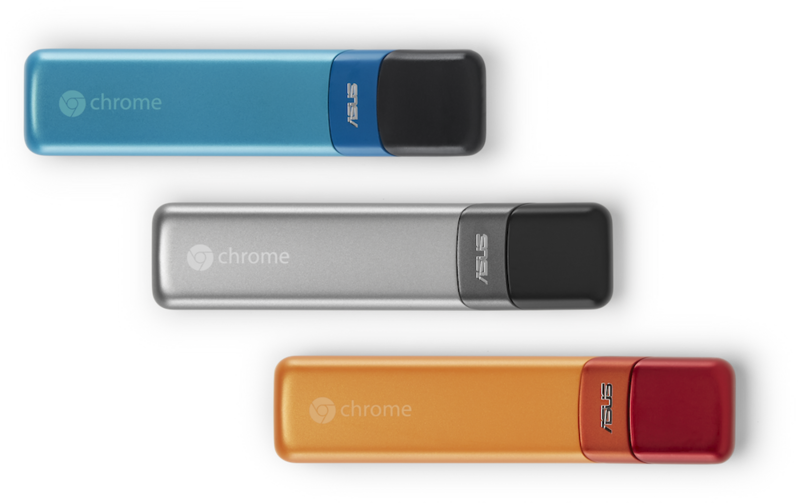 The Chromebit will have its users further help Google spread their magic by allowing the Chrome OS onto your SmartTV’s. So how exactly will the Chromebook Flip switch things up as a laptop-tablet hybrid? By going with the same concept the Yoga tablets did of course! Instead of detaching the touchscreen from the keyboard, the screen itself will be able to flip in a 360 angle. Naturally for that point, you can use it as your own Asus Chomebook tablet should you so desire, since it does come with the added touchscreen now. If you go the Chromebook Flip route, the cheaper model comes with a Rockchip 3288 processor with 2GB of RAM and 16GB of eMMC flash memory. If you want to spice it up a bit and go for the higher end model, you’ll end up with 4GB of RAM and 16GB of SDD storage space. The latest Wi-Fi and Bluetooth capabilities come standard for both models and, starting at $249, it’s not a bad start for a budget tablet-laptop hybrid. The Chromebit will be accompanied by the same internals as it’s Flip cousin. That being said, it will also host a slightly larger-than-average thumb drive. The Chromebit will also have an HDMI port, as well as a USB 2.0 port. It’s internet capabilities will stem from the same Wi-Fi and Bluetooth features as the Flip. Now here is the odd part about the Asus Chromebook Flip featuring a touchscreen; Google’s Chrome OS hasn’t been, nor was it ever, optimized for touchscreen capabilities. That alone is a bit strange, and to top it off, the touchscreen is being added to a budget tablet-laptop hybrid. The reasoning behind these features on a budget device are anyone’s guess at this point. 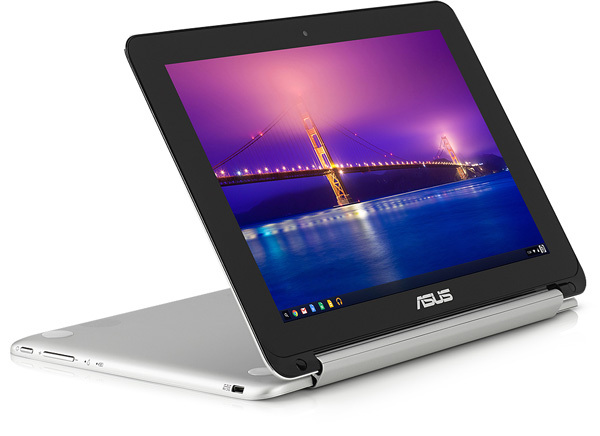 Google has had Chromebooks being issued by other tech companies other than Asus. Take Haier and Hisense for example. Both companies have announced their own Chromebooks that will run $100 cheaper than Asus’ new product. The best part is that it looks as if these Chromebooks will feature the exact same internals as the Flip, only without the guinea pig touchscreen. Only time will tell if Asus’ new Chromebook Flip will actually take off, especially with software not meant for a touchscreen. For a while, rumors of a new 8 inch Windows tablet from Asus have been floating around. In mid December, some specs got leaked, and recently, a user manual for the Asus VivoTab Note 8 randomly popped up on Asus.com. The new tablet hasn’t been announced by Asus yet, and no one knows when the manual was published on the website or if it was mistake or not. Either way, it leads us to believe that there may be a big announcement about the new tablet at the CES trade show in a few days. The manual that popped up didn’t mention anything about the specs of the tablet, but the previously leaked information said that the device will be powered by a 1.33GHz Intel Atom “Bay Trail” Z3740, an 8 inch display with 1280 x 800 resolution, 2 GB of RAM, 32GB or 64GB of internal storage space, a microSD slot, a 1.2 megapixel front facing camera, and a 5 megapixel rear facing camera. It also comes equipped with Windows 8.1 and a free version of Microsoft Office 2013 Home and Student. The specs are almost identical to the Dell Venue 8 Pro and the Lenovo Miix 2. Throwing another tablet in the mix with basically the same exact specs, it makes it seem like we will have the same problem we had with the early Windows Phones. There will be literally nothing to differentiate one from the other besides the name of the manufacturer printed on it somewhere. The newly discovered online manual confirms this, but does not mention Wacom. Other competing 8 inch tablets offer styus support, but Wacom is the best and would be the main advantage to the new Asus tablet. There is currently no word on availability or pricing for the device yet, but Asus will more than likely make more announcements on that at CES. Asus was a little bit late to the tablet game, but they were one of the first computer companies rumored to be working on a Windows slate, and it seems like they may be a little bit ahead of the curve, despite their lateness.